The Sustainability Live Exhibition was a great forum for showcasing energy efficiency ideas! We attended the Exhibition at the NEC from 21-23 April, and this year there was a particular focus on identifying energy saving opportunities, especially in terms of meeting the requirements of ESOS. 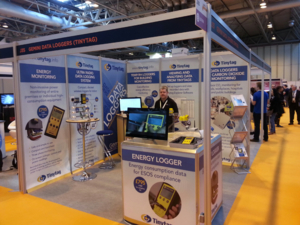 We sponsored the 'ESOS Trail', showcasing how Tinytag data loggers can be used to help identify areas and equipment that would benefit from energy saving measures, and then help evaluate the performance of any improvement measures in line with ESOS, ISO 50001, and other energy management requirements. can be a useful tool in providing information to help identify opportunities for energy savings. can help to identify energy saving opportunities in order to improve energy efficiency and cut costs according to ESOS scheme. Find out more about how data loggers recording temperature, relative humidity, CO2, count, voltage, power usage and other parameters can test, measure and help verify improvements, and how they can help validate overall building systems performance. You can also learn more about using data loggers to monitor energy consumption in line with energy management regulations including ESOS.